September 21, 2013–Conservation of water is a necessity in arid zones and drip irrigation is far more efficient than traditional methods of watering crops and lawns. With yard care, sprinklers emit 1-5 gallons of water per minute, watering everything the spray can reach, evaporating into the air, not reaching the roots of the plant, and, generally– wasting water. Drip irrigation deposits water only when the weather is dry, then depositing it directly to the roots of the plant, the water emitted in gallons per hour instead of gallons per minute, as with traditional sprinklers. This slow flow of water by drip irrigation insures that the plant will absorb the water and won’t be lost in wasteful evaporation. Dov Pasternak, a university professor from Israel, has been working to install irrigaton systems in arid parts of Africa for over 10 years, using diesel engines to power the water pumps for drip irrigation, as most of Africa is off the power grid (see satellite picture of Africa at night). In 2007, Bob Freling, of the Solar Energy Light Fund, wanted to try something in Africa that had not effectively been done before-combining solar and drip irrigation. Pasternak agreed to work with Freling on the project, even though he didn’t believe solar energy would efficiently run the pumps. Freling’s intention was to create electricity in villages, but he soon found out electricity took a back seat to a more important need–food! “Chronic food insecurity was their number one concern, it’s pretty basic on the hierarchy of needs,” he stated. 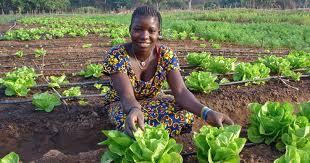 Food could only be grown in the rainy season if there was no drought and if there was a drought there were no crops, which was directly related to malnutrition and sickness in Africa, particularly in children. And so, in 2007, began the Solar Market Gardens in Benin. Women in Africa have traditionally been the gardeners, carrying the water by hand from whatever water sources were available, to their gardens. Bob Freling and the Solar Energy Light Fund worked with women in two African villages, changing their irrigation methods from carrying water by hand to solar drip irrigation. One village drew its water source from a year round stream, the other from 82 feet below the surface. Three, battery free, emissons free, solar powered pump systems were installed in the villages, the pumps running strongest when they were most needed– when the sun was shining, drying out the African soil, leaving the plants in desperate need of water. Though the initial cost was higher than that of the polluting, deisel fuel generators, the cost over time has been less for solar, the system paying for itself in 2 years. The environmentally sustainable project has been a success, supplying 1.9 tons of produce per month in the villages, including tomatoes, okra, peppers, eggplants, and carrots, increasing vegetable intake by 500-750 grams per person every day, the same as in more affluent countries. The first three systems cost $25,000 and have already paid for themselves! One man stated ” As a child, I saw carrots in a book, and now the kids are eating carrots!” During the first year of solar operated gardening, the women farmers kept 20% of the produce to eat and were able to make a profit by selling the rest of their produce in local markets! And because these women are not spending their time carrying water they have the time to spend at these local markets, selling their vegetables, their profits often going to school fees and medical care for their children. After the success in these two villages, the Solar Energy Light Fund has included many more villages in their project plus projects in other countries, including Haiti. Solar Energy Light is now partially backed by contributions from National Geographic and plans to install solar systems in villages to include not only gardens and farming but homes, schools, street and market lighting and heath clinics. One last mention of a company that is doing something, Vortex Engineering. It’s a company that’s installing thousands of solar powered ATMs worldwide, focusing on rural needs in India, Africa, and Asia. They have been selected by TIME magazine as one of the top ten start-up companies that will “change your life”. I commend Vortex and Solar Energy Light for making our world just a little better place to live for present and future generations! Categories: Energy Programs | Tags: Africa, Drip irrigation, Ending Malnutrition in Africa, Feeding the poor in Africa, Green Revolution, Solar-powered pump, TIME, Vortex Engineering, Women In Africa | Permalink.